Last summer, I bought a slew of new comics in DC’s New 52 line-up, mainly after falling in love with the Justice League series. While Aquaman was a real surprise for me as being a new favourite, I also really enjoyed Green Lantern, which was another surprise. 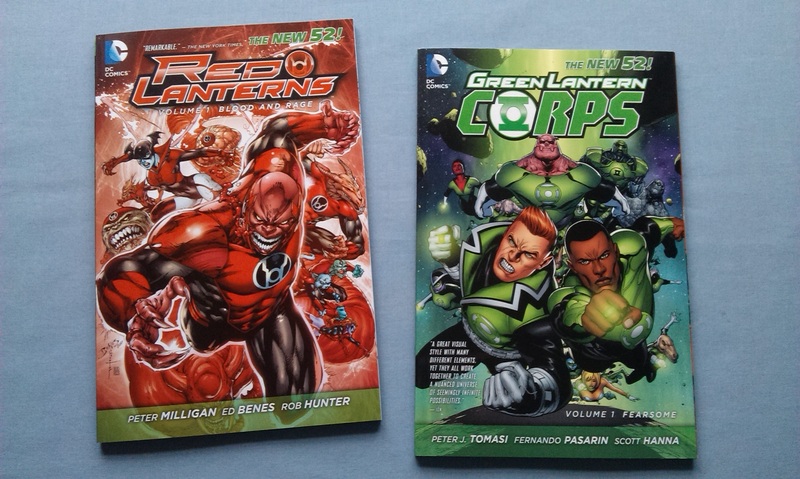 Deciding to investigate more of that book, I bought the first volume in his series, as well as these two books, Green Lantern Corps and Red Lanterns. I’ve already talked about how I found myself disappointed in the Green Lantern series, which I suppose is why I hadn’t gotten round to these books until fairly recently. Let’s start with the Green. Green Lanterns defend sectors of the universe from all manner of threats, and are governed from the planet Oa, which is the centre of the universe as far as these things go. The Lanterns have power rings, which they can use to create constructs and so forth, and also seem to help them fly. However, these rings need to be powered somehow, and an entire planet was given over to tending to the batteries for these power rings. The natives of this planet, called simply the Keepers, prospered, until the batteries were removed, and the planet began to wither. The Keepers therefore decided to replenish their world by stealing forests, oceans and breathable atmosphere from other worlds across the universe. When the Green Lantern Corps show up to stop them, some of them are captured, and tortured into revealing the secrets to the defenses of Oa. What a weird, weird story. Once I’d gotten into it, it was actually kinda interesting, but I get the feeling that I probably would have gotten a lot more out of the story had I been more invested in the lore of the Lanterns. It was interesting to read about these aspects of the DC universe, for sure, but I think ultimately I just wasn’t all that hooked. Red Lanterns is altogether a different beast, though. The Red Lanterns are a weird collection of anti-heroes, who fly about the universe dispensing justice wherever they sense rage. Or something like that. They’re led by Atrocitus, one of the most hilarious villain-names ever, who controls his followers through weird blood-magic rituals. The first volume in the series, Blood and Rage, is actually a decent reboot style of origin story, as we get as much information to make the book work, yet a clear sense of history going on all the same. However, my main gripe here is that nothing much really happens. Atrocitus decides he needs a lieutenant to help him in his crusade, so uses his blood magic to restore some sense of sanity to Bleeze, and there follows several issues of a power-play between the two, where Atrocitus is convinced she is trying to displace him as leader of the Red Lanterns, then she finally does. Along the way, we get some interesting moments, but otherwise, it’s a bit more of a character story than an action story – which is unusual for the first volume of a series like this, you know? Ordinarily, these kinds of stories are told around the third volume mark, once we’re sufficiently invested in the characters. As it stands, while I think I enjoyed the book, it was certainly heavy-going. A bit of a mixed-bag, then, all told. I’m sure fans of the whole sci-fi Lantern stuff will enjoy these things, but I think they were both a bit of a miss for me. Author spalanzPosted on March 3, 2017 February 23, 2017 Categories comic booksTags DC Comics, DC week, Green Lantern Corps, Red LanternsLeave a comment on So many Lanterns!